With the ever growing popularity of Twitter, the number of users is increasing rapidly. Almost all of the twitter users must be aware of TweetDeck, the most widely used Twitter clients. But due to its incapability to support the Android platform, it was pushed back for quite a time but this was recently overcome by launching a TweekDeck Twitter client that supports Android platform. Started recently, this famous application will regain its grounds by being launched in Android OS based devices. According to users, the TweekDeck application pretty much provides the same flexibility and user-interactivity as the beta app. However, some of the functionalities are not still polished enough for attracting more number of users. The TweekDeck app serves as an all-in-one application that offers the users support for Twitter, Facebook, Foursquare and Buzz. Even though some functions are not fully polished, the interface of the current version of application has quite a decent and clean interface. 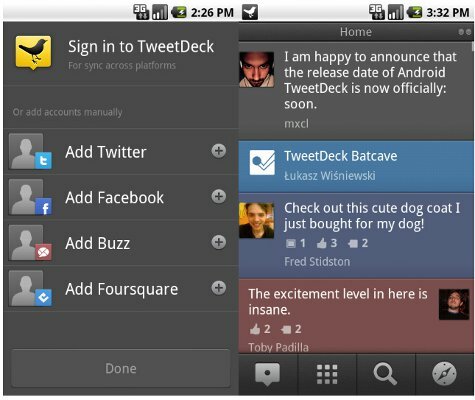 The TweekDeck version of iPhone does not have the support for Foursquare and Buzz yet. In the forthcoming iterations of the client, TweekDeck promises to add more interactive interface, support for multiple Twitter accounts, enhanced maps performance and ability for uploading videos. To be a part of beta testing program and to check out how to install the app on your Android OS device do head over to the official TweekDeck website.